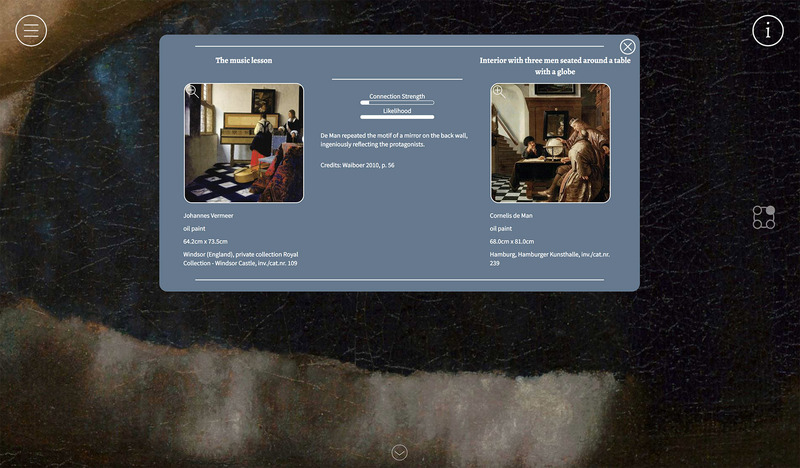 Over five years, an international team, led by the National Gallery of Ireland, conducted research into this fascinating network of relationships between Vermeer, Ter Borch, Van Mieris and others. 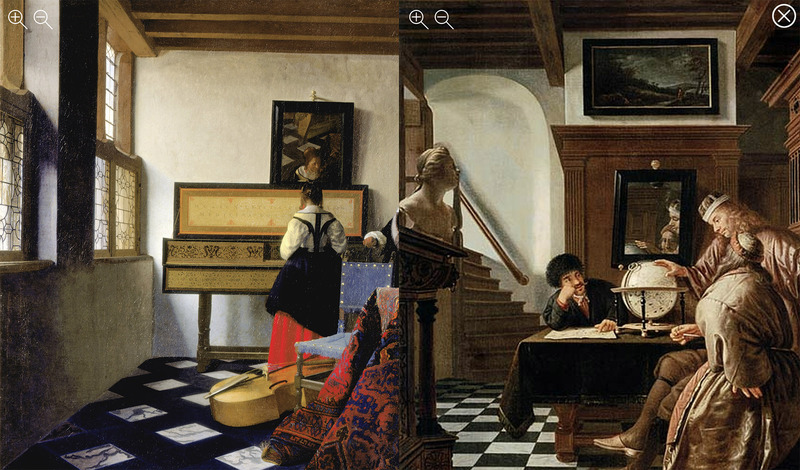 One of the outcomes of this research is the exhibition Vermeer and the Masters of Genre Painting: Inspiration and Rivalry. 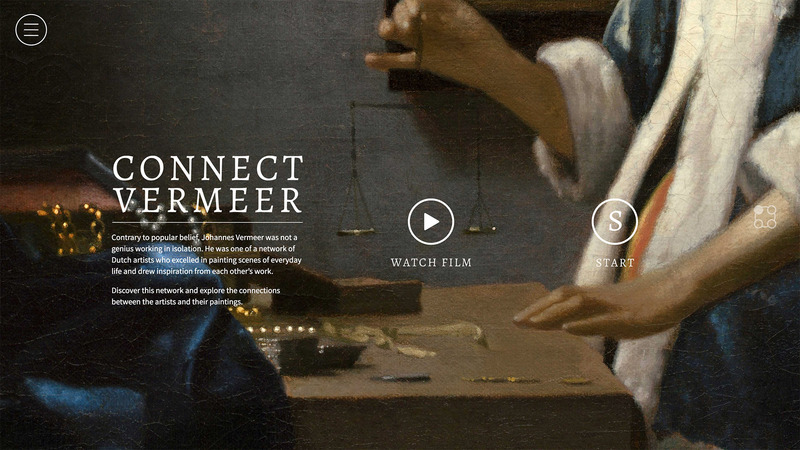 A second outcome is the Connect Vermeer website: a digital research platform that allows users to explore the web of connections between the seventeen Dutch genre painters. 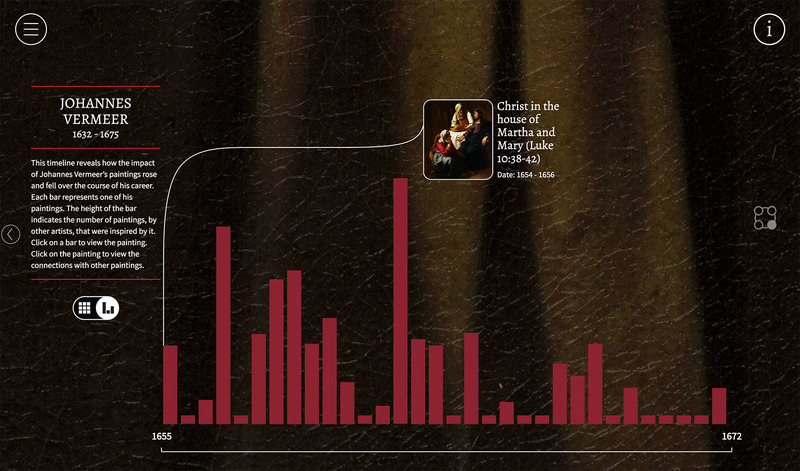 Using interactive data visualisations, users can dig down through layers of data from the macro level to the micro level. We begin with a bird’s-eye view of the full network of 17 artists and visualise the strength of the relationships between them. The user selects an artist to sit at the centre and watches as the others reposition themselves: the closer they are to the central artist, the stronger the connection. The size of each artist’s node reflects the overall impact of their artwork on others, over the course of their career. 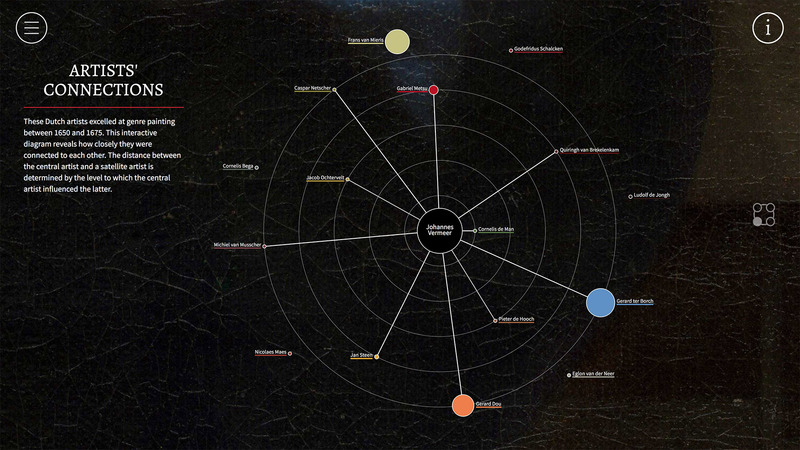 This solar system of artists was the best way we found to visualise the data that we had, and at a glance we could see who was influential in the period and who was influential on a particular painter. The users could then take a closer look at a single painter’s artistic output and discover how the impact of his paintings rose and fell over the course of his career. Then, they can take a closer look at a single artwork and learn which paintings served as inspiration for it, and what paintings it, in turn, inspired. Digging deeper they can examine the connection between two paintings. They can read about the links that have been identified by art historians, or, view high-resolution images of the paintings side-by- side. Zoom and discover the similarities in composition, subject matter, motif, and technique. We really enjoyed this project and it is a great example of technical and creative know-how combining to create something special. Working with the National Gallery and with such beautiful material was a real pleasure. It was also great to feel part of such an important exhibition in Ireland and at such an important time for the National Gallery as they launched their magnificent refurbished galleries.